The Sub-Freezing Air Dryer aims to provide very dry air without wasting energy or purging compressed air, allowing customers have the full capacity of their compressor. Sub-Freezing Air Dryer delivers Class 3 air previously only achieved by desiccant technologies. 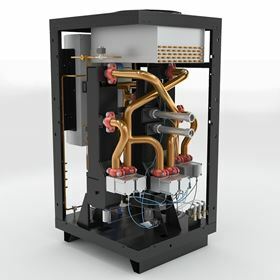 Ingersoll Rand says that its Sub-Freezing Air Dryer is the world’s first dryer that provides -20°C (-4°F) pressure dew point at 70% lower energy costs and 40% smaller footprint than that of traditional desiccant dryers. The dryer is designed to be compatible with oil-flooded rotary compressors, oil-free rotary compressors, centrifugal compressors and reciprocating compressors. The Sub-Freezing Dryer supplies a constant ISO Class 3 -20°C (-4°F) pressure dew point air, regardless of changes in demand or ambient temperatures. This allows customers to dependably meet the compressed air needs of their operation. The air dryer has been designed for general purpose or the manufacturing of critical products such as pharmaceuticals. Ingersoll Rand claims that the dryer has a lower total cost of ownership than traditional regenerative desiccant dryers and has an 80% lower maintenance cost than drum dryers. Unlike drum and desiccant dryers, there is no costly periodic desiccant replacement, and with no desiccant required, downstream particulate filtering is not needed.